THE SOUTH CAROLINA HIT PARADE, produced by CJI’s Jack McCray, featured musical arrangements, for the first time, by jazz musicians native to Charleston and other places in South Carolina who left an historic jazz legacy. 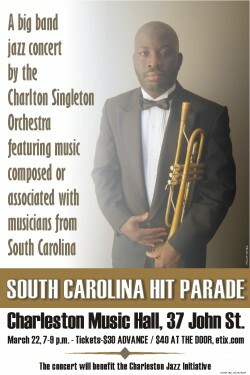 This music was performed by some of the finest musicians who actively work Charleston’s contemporary jazz scene. They make up the Charlton Singleton Orchestra, the debut of a 20-piece big band led by CJI musician, Lowcountry native, trumpeter, composer and arranger, Charlton Singleton. The orchestra’s rhythm section included CJI’s popular ensemble, the Franklin Street Five, a Jenkins Orphanage tribute band, led by CJI music director, Quentin Baxter. Rounding out the section was bassist Kevin Hamilton, and pianist Richard White, Jr. They were joined by Robert Lewis on alto saxophone; saxophonist Mark Sterbank and arranger of several concert tunes; trumpeter Chuck Dalton; baritone saxophonist John Cobb; vocalists Tony Burke and Ann Caldwell, Charleston’s first lady of jazz; Fred Wesley, Jr., former bandleader for James Brown; guitarist Lee Barbour, one of the best young jazz guitarists in the country, according to guitar giant, Joe Beck (Miles Davis’ first guitar player); and more!